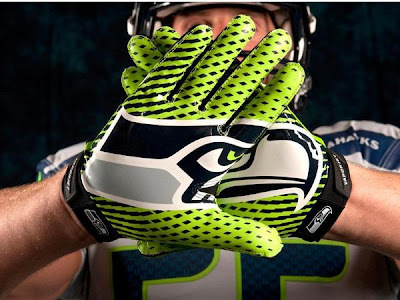 I don't know anything about sports and athletics, but the Seattle Seahawks just unveiled some new uniforms (but, honestly, I don't really know what the old ones looked like!). The new uniforms feature a deep blue, neon green and wolf grey color scheme. Nike said that the green represents the vast forests of the Pacific Northwest and the grey is an homage to the "beautiful, gloomy weather" of Seattle. A stack of twelve Native American-style feathers running down the pant leg and along the collar is a special shout-out to the 12th man (who ever that is). Finally, the Seahawk logo on the helmet now connects on the back. I'm not sure, but I'm pretty sure that the gloves pictured above look pretty cool. Want to know more about the manly make-over? Just click the vid below, or click here and here to see more. Football has 11 players, so 12th man is the fan.